Home>Logos 4>How to 'show-off' your Logos 4 library! For those not familiar with my bibliographic report, you simply upload a large file from your Logos installation, and my website does the rest. Wow! How many storeys tall did you say that bookshelf is again? Seriously, Wow! This is really cool! I love it! At a width of 1280 pixels my 'bookcase' was 445 shelves high. If the average shelf is 10 inches high, that's about 371 feet, or about the same height as St. Paul's Cathedral in London! At a width of 1280 pixels my 'bookcase' was 445 shelves high. If the average shelf is 10 inches high, that's about 371 feet, or about the same height as St. Paul's Cathedral in London. You call that showin' off? How do you figure out how many shelves your library is? You didn't count them all did you? 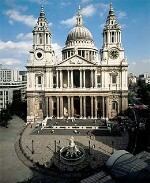 ... that's about 371 feet, or about the same height as St. Paul's Cathedral in London! Thanks! I love this! I'm pretty visual, so this will actually help me in a very practical way. Unfortunately my computer, my new computer has been in critical care in the hospital recently (again). It just came home and I have to reload everything (again). I'm going to try and reload Logos tonight during the night. Then, hopefully, tomorrow I can do your way cool report! This is cool. I was really hoping L4 would have a visual bookshelf feature similar to what you have done here and similar to programmes like Delicious Library. Cool! I love it! Even if it's not that functional, it's pretty to look at! 1) Hidden resources still show up on my shelves and I'd prefer not to see them. 4) Also noticeable in the above image: when the Author is blank, the opening comma and space should be omitted. Long-term (in the "dream on" category): I'd love to be able to drag and group and rearrange at will; collapse and drag entire series together and organize my visual shelves much the way I might my physical shelves. Not necessarily in some absolute "computer order"; but all my commentaries together, and then by series within that section, and in canonical order within each series; then in another section all my journals sorted by issue number; then in another section all my church history books by author; etc. Thanks for this, it is great. I do have one problem, at least with my library. About halfway through all my books stop being "on" the shelves and appear between the shelves. I don't know how you all get your bookshelf to appear in your post so I can't show you unless someone clues me in on how to do that. I don't know how you all get your bookshelf to appear in your post so I can't show you unless someone clues me in on how to do that. I use SnagIt, a full-featured screen capture utility made by TechSmith. Jing is a simpler freebie one from the same company. thanks Mark! This is outstanding....a brilliant way to get an overview of my library and perhaps read something I had missed. Thanks Mark, very nice work. I don't know if you've found this out but no one has mentioned it that I can see - if you click on a book, it will open it. Yes, that was the first thing I tried. Pretty nifty! Windows 7 has a nice little snipping tool built right in. What a great feature. I love it!